The usual restaurant haunt for birthdays and special events in our family is at the Dampa stalls in MOA (Mall of Asia). Here, seafood dishes are so affordable, it’s almost like a buffet for the whole family clan. With a slew of birthdays for the month of September, the gang decided to once again head to the Mall of Asia for a seafood fest at Aling Tonya’s Dampa. After braving the strong rain, lo and behold, all the the Dampa stalls in MOA were closed. Not because of the bad weather or the lateness of the hour, but they’re simply closed. Everything’s boarded up; no notice, no nothing. With no other choice, we all went back to our cars and drove for few minutes to Macapagal Boulevard where restaurants serving seafood, Dampa-style, are also located. We settled at the usual spot at Aling Tonya’s and were soon trotting to the seafood stalls to buy dinner. 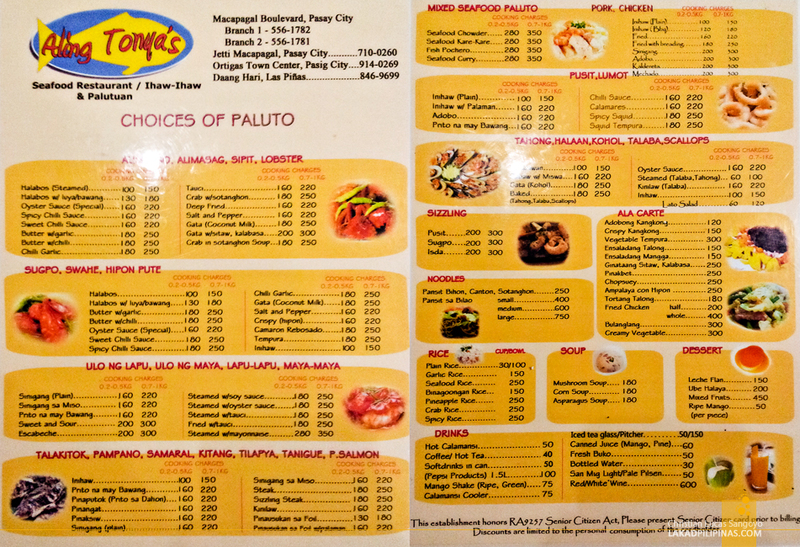 Similar to Bacolod’s Pala Pala restaurants, one buys his own seafood fares and passes them to the restaurant of choice for cooking. Fees for cooking depend of the amount and type of dish you want. The market is located at the center of the Macapagal’s Dampa complex. It looks like any regular wet market, with shrimps, scallops, oysters, fishes and everything in between. One should haggle for prices, especially if you’re buying lobsters. A single piece, which usually weighs in at two kilos, sell for a wallet-wrenching Php1,800.00. So that means no lobsters for us. Instead, we bought three kilos of shrimps (Php380.00), two kilos of pink salmon (Php300.00), three kilos of tahong or mussels (Php80.00) and two and a half kilos of squid (Php280.00). The Dampa at Macapagal sits right next to the Libertad Channel, a body of water that connects directly to Manila Bay. The view is quite nice at night, with the usual trash hidden in darkness. There were times in the past where the bay was pretty stinky, but during our recent visits, the unappetizing smell is thankfully not present. But not to worry, if ever for some unfortunate reason, the stench of the bay comes back during your visit, you can always resort to eating inside the well-lit, air-conditioned dining halls of the restaurants. Us, we almost always dine al fresco. It just seems more fun that way; with show bands taking requests and playing it right in front of us. They even entertain jammers; they play and you sing your song. It’s really fun, well, if you’re into that kind of thing. It took quite a while for our orders to arrive, which is usually the norm in Dampa. The fresh seafood we bought heads straight to Aling Tonya’s kitchen with specific cooking instructions. The shrimps were to be turned into buttered garlic shrimps, the pink salmon into sinigang sa miso, the mussels into baked tahongs and the squid into calamares. Their cooking fee is usually in the range of Php200.00 per kilo. After almost thirty minutes of waiting, our seafood feast started to arrive, one overflowing plate at a time. The pink salmon sinigang na miso landed first and bowls were soon filled with its sour soup. I’m not a big fan of fishes floating in soup with the exception of this one. Was it good? If sinigang is your thing, this is fantastic. Another favorite is Aling Tonya’s baked tahong. Overflowing with cheese and topped with garlic bits, it makes my mouth water just writing about it. And the squid calamares, which is coated in very crunchy breading; cruchy on the outside, very tender on the inside. It comes with unlimited mayo dip too. Last, but definitely not the least, is the buttered shrimp with garlic. Going to Dampa without ordering this is a capital crime. After peeling off the shrimp’s shell, we usually dip the meat on its own sweet garlicky sauce. An absolute favorite. We were 17 in the group and our dinner at Dampa totaled at Php3,840.00 Php5,480.00. Php1,040 Php2,680.00 for the seafood and Php2,800.00 for Aling Tonya’s cooking fee. That’s a measly Php225.00 Php322.35 per person and we weren’t even able to finish everything off. Not bad, eh? 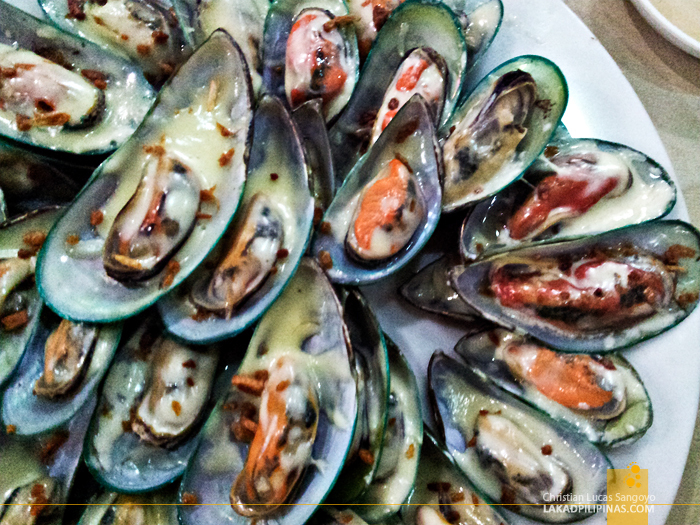 We’ve been ordering the same old seafood dishes every time we visit Dampa, be it in MOA or at Macapagal Boulevard. But with the former closing, I guess we’ve no choice but to transfer our family celebrations to Macapagal. But really, it’s almost the same; the only difference I guess is that we can’t shop at MOA while waiting for our dishes to cook. Our family went back to the Seaside Dampa in Macapagal for this year’s September birthday feast; and as usual, we dined at Aling Tonya’s. A few changes were immediately noticable since our last visit; especially the removal of the al fresco dining area along this part of Dampa. The staff said it was gonna be made into a road. My parents did the usual market stuff, getting three kilos each of squid (Php260.00/kilo), shrimp (Php330.00/kilo) and mussels (Php100.00/kilo) with an additional two kilos of pink salmon belly (Php350.00/kilo). We passed everything to Aling Tonya’s for cooking. We asked them to turn them into calamares (Php220.00/kilo), shrimp butter with garlic (Php250.00/kilo), baked tahong (Php250.00/kilo) and pink salmon in sinagang na miso (Php220.00/kilo). Note that the prices quoted above are the cooking fee. An additional order of pinakbet (Php250.00) and ginataang sitaw at kalabasa (Php250.00) were also added to the mix. Compared to last year’s market price, the prices of seafood was more or less the same. 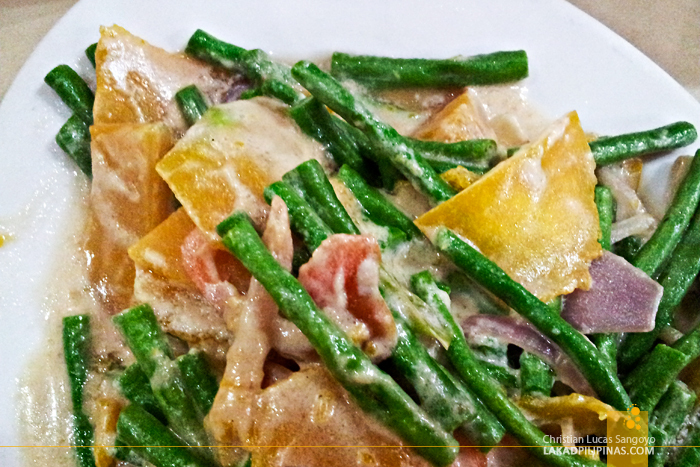 While cooking charge on some of the dishes rose up to as much as Php50.00 per kilo. The food was still as superb as I remembered it to be, with the exception of the calamares which seemed to be a bit overcooked. The veggies were totally unremarkable. This time we were 21 in the group, and if we compute everything sans the rice and drinks we ordered, it totaled to Php5,870.00 or Php279.50 per person. Even with the slight price increase, it was still a good price (actually, cheaper this time since we have added four more persons in the group) for an almost seafood buffet experience. And yup, as before, we still weren’t able to finish everything. GPS Coordinates: +14° 32' 40.64", +120° 59' 12.59"
I think your computation's wrong. "we bought three kilos of shrimps (Php380.00), two kilos of pink salmon (Php300.00), three kilos of tahong or mussels (Php80.00) and two and a half kilos of squid (Php280.00)." how about if we have 10 in the group, and this coming end of march i am going to treat my family..do i need to call for the reservation and the food? Is there a place there that opens at 6 or 7am on thursday 4/17? Well have team breakfast. hi...is the price still thesame as of today? May i know if they accept credit cards? Literal ba na palengke yung bibilhan? And nagissue ba sila ng resibo? hello , may i ask ung lobster is it one lobster had 2 killos and only sell for 1800 pesos or one lobster had 2killos sell for 3600pesos or one killo lobster sale for 1800pesos lang talaga kahit ilang piraso or gaano kalaki basta 1 kilo 1800? sorry kase di ko alam dun eh pero gusto ko pumunta... and try..
Hi Christian, any updates about this place? I want to bring my in-laws from the US here but saw some nasty reviews at tripadvisor. Plase advise. Anong restua kaya tumatanggap ng credit cards specifically AMEX? Thanks! sir ask lng po kung mainly the seafoods lng po ang bibilhin sa wet market? yung gulay at pampalasa eh sa resto n manggagaling? thanks! Sir planning to eat at dampa tomorrow. Thanks for this blog btw. Pero konti lang kami. Mga 4-6 pax magkano kaya magagastos sir? Ganun din kaya kamahal? Birthday kasi ng mom ko gusto ko siya treat dyan. Thanks in advanced sir. Hi, sorry for the delayed reply. Cost for 4 to 6 persons at Dampa Macapagal would definitely be lower than what we had. Could you share your experience, by the way? Hi, Thank you four your blog! We're planning to eat there next weekend and we don't know kung mas Ok ba kumain sa restaurant na lang or try Dampa. Medyo matagal na rin kasi kaming hindi nakakain dyan. Approx. 10pax po kami and do you think po with a budget of 5,000 is enough na po? Thank you and more power. Hi. How about po yung price ng kanin if ever? Thanks! Hi, rice in dampa is quite affordable. At Aling Tonya's, they serve it by bowl, which is good for about four to five people. Can you suggest any restaurant with free videoke? Is there available at Aling Tonya's? Where planning to go there this weekend. Thanks! Aling Tonya's doesn't have videoke, although there are a few around the area that has. Sorry for the delayed reply. We're you able to find a restaurant in Dampa that has videoke? Hi, question, can I host q group of 80 pax in your resto? How much will it cost me? And can I get it exclusive? If so, how much am I looking for?